Built in 1907, the Police Court building was located at 1127 Clark Street near the intersection of Clark and Tucker until 1994 when it was demolished for a surface parking lot. The architect was James A. Smith, commissioner of public buildings. The building sat less than 20 feet from Tucker, and the small left-over space contained two tiny one story buildings, one at the front corner and one a the alley corner (photo below). These were demolished as well. The four story building in the background was demolished a few years later to make way for the City's new Justice Center which replaced its aging jail (subject a future post) behind the Municipal Courts Building (although moving the JC south from its originally intended location spared the historic Court Square Building). The east elevation of the building faced an existing surface lot. At the rear of the building facing the alley on the east corner of the second floor there was a curious window wall and sloped skylight that would be more typical of something one would find in a photography or artist studio. I am not sure if this was original, although it looked quite old. As with many beautifully ornamented building in St. Louis that have come down over the years, Larry Giles of the St. Louis Building Arts Foundation salvaged much of the terra cotta from the building's front facade. See photos here. Just five blocks east of the livery stable currently being demolished on Locust lies an entire block of vacant land. 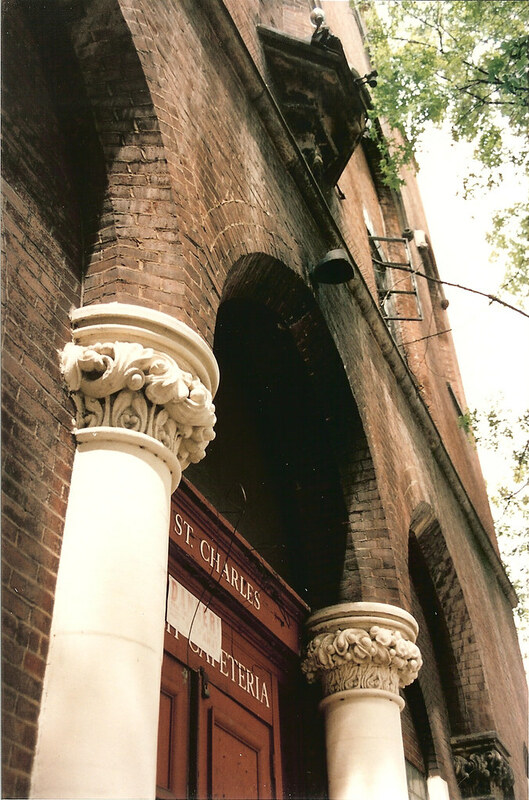 Until August 1995, the southeast quarter of this block bound by the corner of Locust and Ewing (TE Huntley) was occupied by the parish of St. Charles Borromeo. 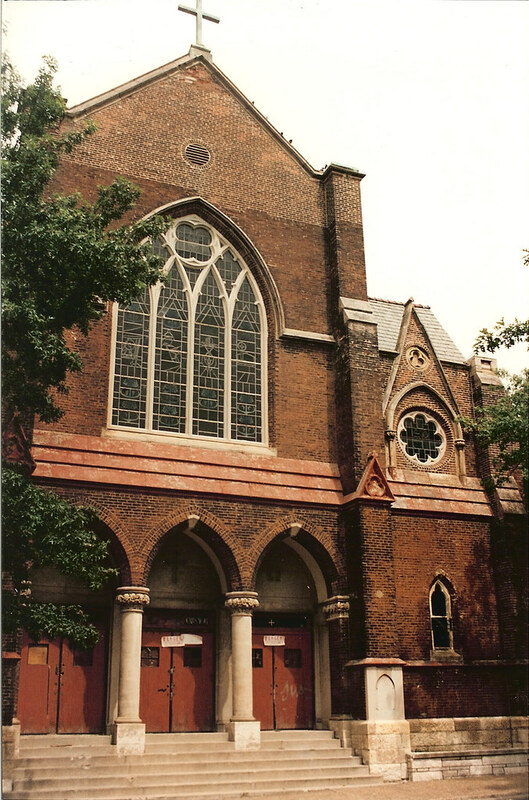 The buildings were originally built in 1867 for S. John's Methodist Church, and they remained until 1901, when they built a new building at Kingshighway and Washington. In 1902, it was sold to the newly created St. Charles Borromeo parish, who occupied until its closure in 1982. The church sat vacant for many years and was not well secured. I do not recall who owned it at the time, but I do not believe it was the Archdiocese. With its location so close to the Harbor Light center, its probable that it was frequented by homeless squatters. At some point there was a fire in the parish hall which faced Ewing which must have weakened the roof structure. There was a visible sag in the middle of the roof, although the roof was not wide open. The sag in the roof got worse, and one day when I drove by, the entire section of roof had collapsed. The roof structure consisted of large timber trusses spanning the width of the hall with the roof spanning the other direction between trusses. The failure of a single timber truss led to a collapse of the section of roof on each side. To make matters worse, this was also the section of roof that connected to the sanctuary structure that fronted on Locust. Not long after the roof collapse, the city condemned the building and the entire complex was demolished. 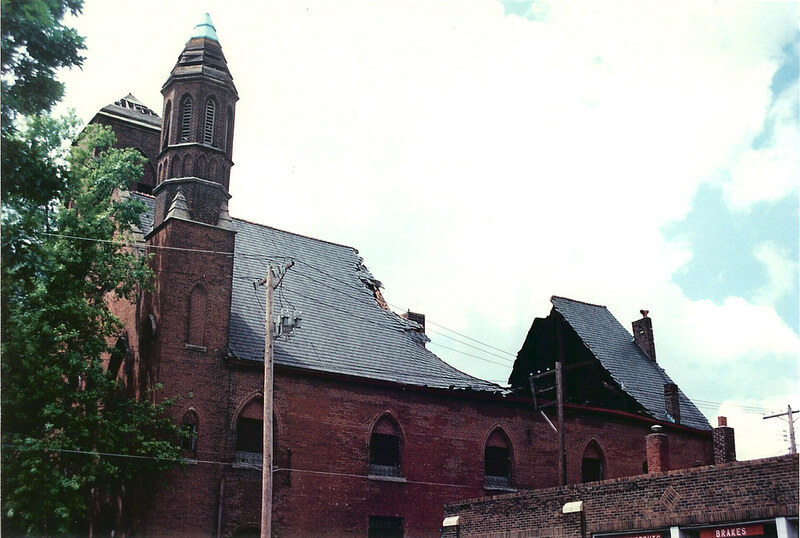 View of the collapse from the southwest. The sanctuary is to the right of the tall chimney. As devestating as the collapse appears, the rest of the building complex was stucturally sound. Given the right owner, even damage like this can be re-built and the building saved. The entrance to the parish hall on Ewing with the condemnation notice tacked on above. The doors were unsecured, allowing me to get some shots inside. 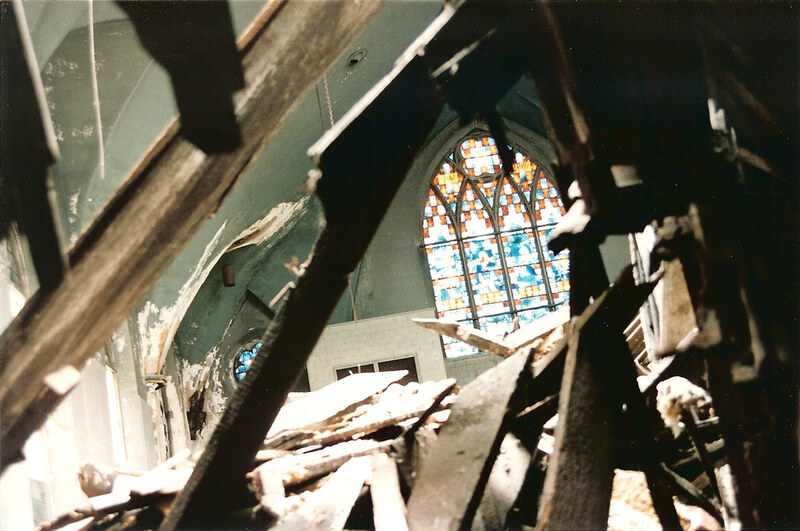 Looking through the wreckage into the sanctuary. The large stained glass window facing Locust is the same one in the first photo. 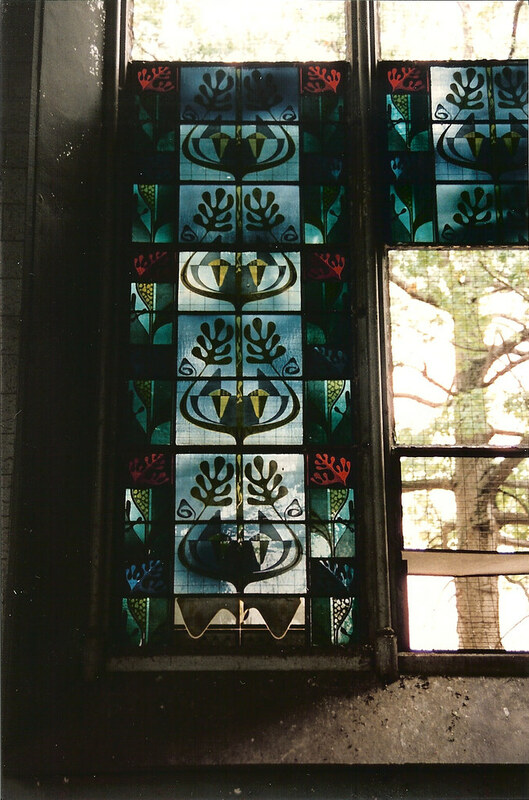 The sanctuary windows had panels of Matisse-like stained glass. 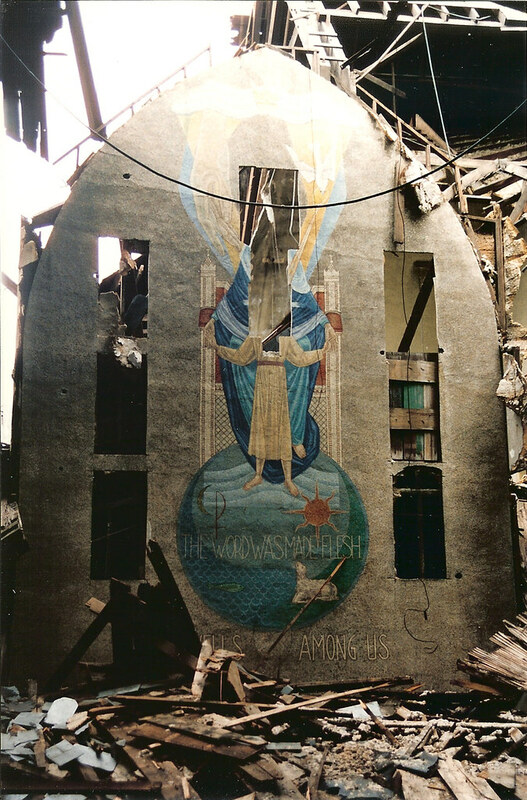 The front wall of the sanctuary, where portions of the large wall paintings had previously been cut-out. 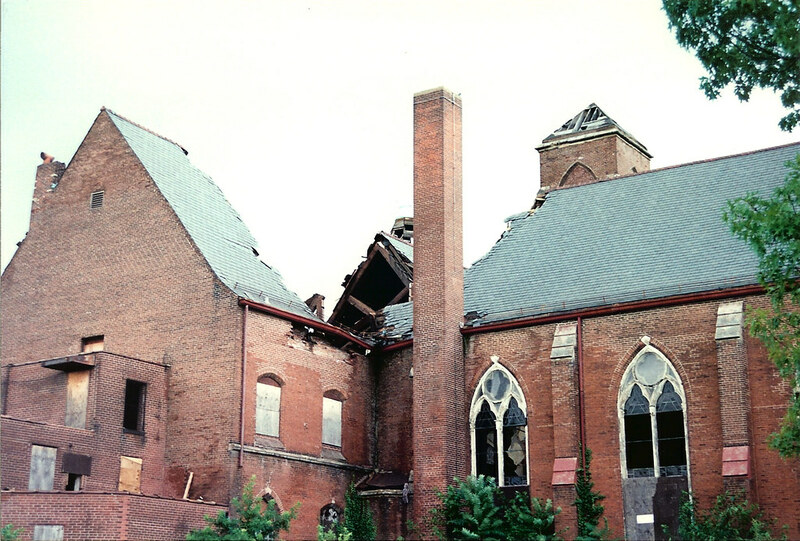 Above the wall can be seen the open structure of the parish hall roof and the opening left where the portion had collapsed. Vanishing STL was created to illustrate the continuing loss of irreplaceable architecture from landmark buildings to ordinary homes due to demolition, abandonment and neglect. Often I write about structures threatened with demolition to bring awareness of the situation and promote preservation as an alternative. All photos are by Paul Hohmann unless noted otherwise. So You Want to Save a House? 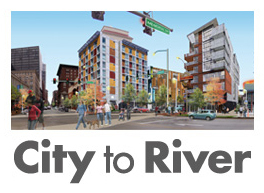 STL-Style partners with ABC's Modern Family! Times Square Meets Downtown St. Louis?